5 Photos you should take this Easter! My favorite holiday to scrapbook is Easter. I love the frilly Easter dresses, brightly colored plastic eggs, fresh flowers popping up out of the ground and pretty pastel candy! this feast of springtime color is perfect to capture in photos. Before you head out (or host) this years Easter Celebration here are some photo tips for you! When photographing kids capture them being kids, chasing after eggs, playing and having fun. Check out this photo I tool last Easter of my nephew. My sister set him in frount of her flower garden and let him play and I got a great natural shot! Tip 2: Get a semi-posed family photo! Notice the photo of the baskets of eggs only, this after the hunt photo make a perfect embellishment for the page. Also consider taking photos close up in macro mode of jelly beans, easter grass and other candies for nearly free scrapbook embellishments and they will be authentic too! Tip 4: OK this is a scrapbook tip-try kraft colored paper for your scrapbook pages, it looks great with pastel springtime shades (see above photos) a swipe of pastel paint adds a nice touch too and best of all you keep the focus on the photos! Tip: 5-Photo the Pre-Easter Events. Note: If I had to do it over I would have taken the photo outside with no flash 😀 Sometime your photos are not perfect but you should still scrap them, that’s what is important. You kids will not care that the lighting isn’t perfect, they will be glad to have the memories. Here I took a bunch of egg dying shots and used a egg-shaped puzzle template to make this page. Also I saved the egg-dipper and used it as an embellishment! And some freebies for you! Great tips Lindsay and lovely scrap book pages too. 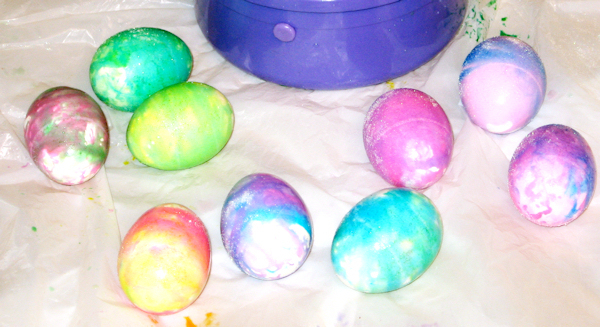 Wow, great tips and I LOVE the Egg Dyeing page! I may have to scraplift! These are really great pages. Thanks so much for playing along on FOr Fun. I really like the egg puzzle one Great idea. Great idea to repurpose that egg dipper! That’s definitely a huge part of dying eggs. Thanks so muchf for sharing your project with us at Papercraft Star! Great projects. Thanks for playing with us at Going Grey with Scrap-Creations. That egg dipper is such a fun way to embellish a layout! Thank you for joining us this week at Papercraft Star! I just love these LOs!! Thanks for playing along with The Sisterhood of Crafters. Awesome layout! I love that you placed the photos in the shape of an egg… very clever use of space. Thanks for playing with us this week at Amber’s Crafts and Stuff. I hope you’ll join us again soon. Oh I do love those fabulous layouts and the vibrant photos! Thanks for joining in the Sisterhood of Crafters Easter Eggstravaganza! WOW!!!! Your layouts and pics are just amazing!! Thanks for playing along with our Sentiments challenge.